Pin It It was back-to-school week at our house. I had some mixed emotions about the whole situation. The girls have been pestering each other for awhile, and so I was really happy for them to go to school so they could leave each other alone and put there energies into something else. But, my baby was heading to kindergarten, and that makes me sad. My kids are growing up too fast, and I am reminded of that each time September rolls around. I guess there's not much to do but look on the bright side: they are alive and well, and I get the opportunity to watch them grow, despite how I wish it would slow down. My oldest is in grade five. This is almost incomprehensible to me. Before I know it, she will be in university. Why is it that when you're young, all you want it for time to go by faster, and when you are an adult, all you want is for time to slow down? Since I can't sit around wallowing about how fast time is passing by and how soon I will be geriatric, I figured that I might as well bake some things for school. We started out with the easy things: rice krispie squares. I brought rice krispie treats to my girls' soccer game once, and one mom told me that they were better than hers, and asked what did I do differently. Other than using real Kellogg's Rice Krispies instead of her generic version, I didn't know. Recently, though, I read the back of the box, and the recipe is different than the one that I use. The conspiracy theorist in me thinks that they omitted an ingredient in the recipe when they started boxing their own treats for so much more money. (Can I tell you that I just don't understand why anyone would waste so much money on a little box of treats, when you can make them at home for a fraction of the price? And, really, ten minutes and you're done.) They freeze great, too, so you can have them on hand whenever you want. My kids pull one out before school, and it's thawed out by the time they're ready to eat 'em. In fact, I pretty much freeze every snack I make, squares, muffins, cookies, whatever. So, what do I do differently? I put in vanilla. 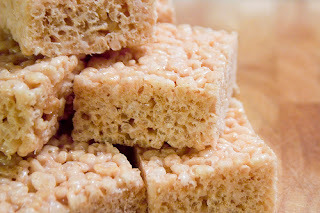 And, I usually double my recipe, but cut the rice krispies down so that they turn out softer. Grease or spray a 9x13' pan and set aside. In a large saucepan, over low heat, melt margarine. Add marshmallows; stir until melted and well blended. Remove from heat. Stir in vanilla. Add cereal, stirring until coated. Press into pan, using a lightly buttered or sprayed spatula, waxed paper, or your own greased hand. Once it's set, you can cut into portions, wrap individual pieces that are left over after your family attacks the pan, place them all in a ziploc bag, and toss in the freezer until ready to eat! Ok, it's Saturday, and the wind is nuts outside. Kids are bored, so we're going to go make some goodies for next week!